Would a Rose Aboard Shuttle Columbia Smell as Sweet? 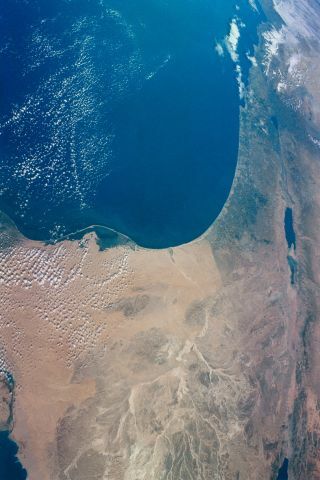 This view featuring the southeastern Mediterranean and Egyptian/Sinai Peninsula/Israel border was photographed by an STS-107 crewmember onboard the Space Shuttle Columbia. CAPE CANAVERAL, Fla. — Scientists are hoping the sweet smell of success doesn't turn sour aboard shuttle Columbia. Astronauts working in Earth orbit are growing flowers that could produce a new scent, which in turn could fuel a multi-billion dollar fragrance and flavorings industry that is always looking for something new. Perfumes, body lotions and dozens of other personal care products and flavorings mostly get their unique aroma from the essential oils that are harvested from flowers grown on the ground. And during the 1998 shuttle mission that included astronaut John Glenn, researchers discovered that a flower grown in space produces a slightly different oil — a still not fully understood result of the flower blooming in microgravity. Since then the fragrance produced in space was incorporated into two commercial products: a perfume developed by Shiseido called Zen and a body spray developed by Unilever called Impulse. The experiment is being repeated during Columbia's marathon science mission and so far scientists on the ground are encouraged by what they're seeing. "Overall it's going extremely well," said Weijia Zhou, project manager and director of the Wisconsin Center for Space Automation and Robotics said Wednesday. "It's truly fascinating to see two flower plants doing very well up there." The experiment is called Astroculture and it is sponsored by International Flavors and Fragrances, Inc., of New York. A rose flower plant and a rice flower plant are being grown inside an environmentally-controlled chamber aboard Columbia. Similar plants and hardware are growing in an identical device on the ground. The only difference between the two: the microgravity in orbit — and it's enough to make a difference. Tiny fiber optic filaments coated with an absorbing material are being laid atop the blooming plants to collect a total of four samples of the flowers' essential oil. Samples were successfully collected Tuesday and Wednesday, with two more planned for Thursday and Friday. The samples will be preserved in orbit and upon delivery to scientists on the ground, the oil's chemical make up will be determined to create a so-called reference model. That model will be compared with the models of other fragrances to begin determining if a pleasing, new scent has been created. "A lot of people come in to sniff," Zhou said. "These people are the elite perfumers in the world." Two scents will be shared with the perfumers, one of which is from the space-based flower. "If the overwhelming feedback points to one or another, then that tell you the results," Zhou said. Once the model is understood and approved, the oil can be chemically reproduced, which means that a space-based fragrance doesn't have to be manufactured by flowers growing in space. Finding the right model remains a tough task, Zhou said. Fragrance researchers can spend years combining different chemicals to try to find the right model that will work as a successful scent. And so how does a space-based scent from a rose compare to the scent of the same rose grown on the ground? "Mild and pleasant," Zhou said, noting he doesn't have an expert's nose. Almost at the half-way mark, Columbia's 16-day mission remains scheduled to land at the Kennedy Space Center on Feb. 1.